How a common pain point led us deep into the physical product world, from designs and prototypes to a KickStarter launch and everything in between. This is what my videographer Caleb Wojcik and I said to each other 15 months ago—almost in unison—as we observed video creators of all types walking around the VidSummit event in Los Angeles. That thought immediately turned into an idea, which then turned into some drawings, which turned into prototypes, which turned into what is now a new hardware brand that just released its first physical product into the world on Kickstarter last week. 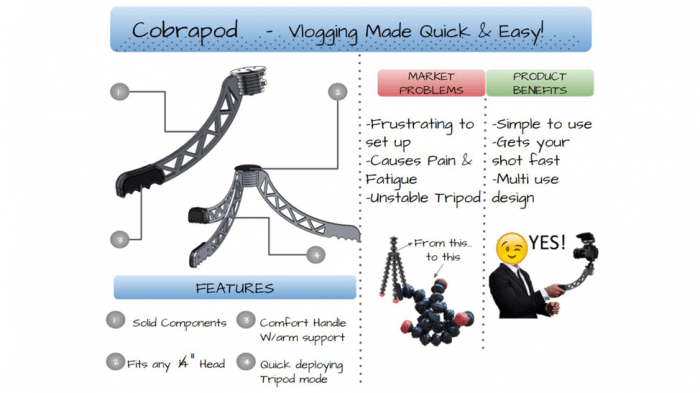 Meet the SwitchPod, the first tripod invented specifically for vloggers. This blog post is an all-in, super-detailed account of every part of this entire process. From how this idea came to be, who we worked with, every single design iteration, development costs, future potential manufacturing costs, how we’ve marketed and will continue to market this product, lessons learned, our biggest worries, and also our biggest dreams. Caleb and I have never done anything like this before. We are not experts on the topic of designing and manufacturing physical products, and although we’ve put in a lot of seemingly great work behind the product and the campaign that just went live, there is a chance the product will not be funded, and it could ultimately turn into an expensive learning experience. Have a better understanding of how the process of designing and manufacturing a physical product works. 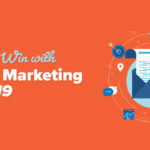 Gather some new marketing ideas for any projects you may currently be working on. Get motivated to try something new and challenging in your own life. At VidSummit 2017, Caleb and I were standing in the main lobby and saw almost every attendee walking around with a camera (DSLRs, mostly) for shooting video. This was not unusual for an event that’s all about making videos. The GorillaPod is a versatile tripod. 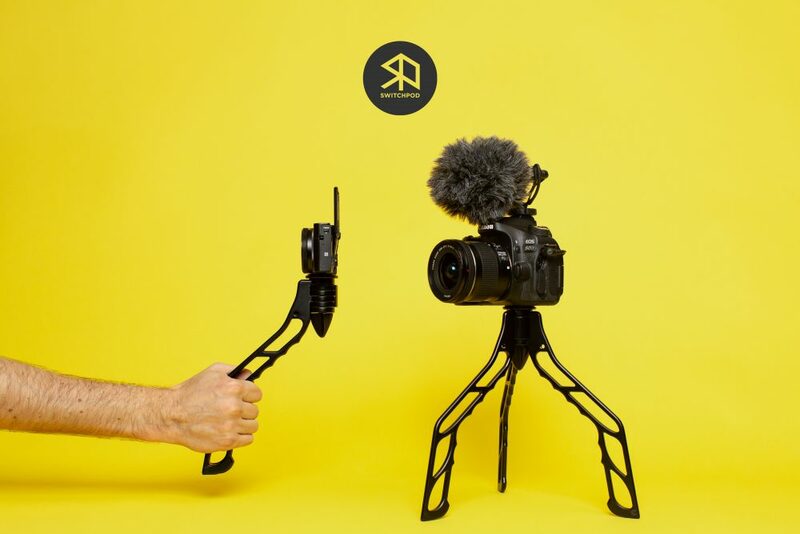 It has flexible legs that can wrap around poles and tree branches, the ball head allows your camera to swivel 360 degrees, and there’s a quick release clip to easily remove the camera, too. It was launched by Joby in 2006. YouTube had just launched a year earlier. Vlogging (video blogging) had been around beforehand, but YouTube made videos easy to find and share. 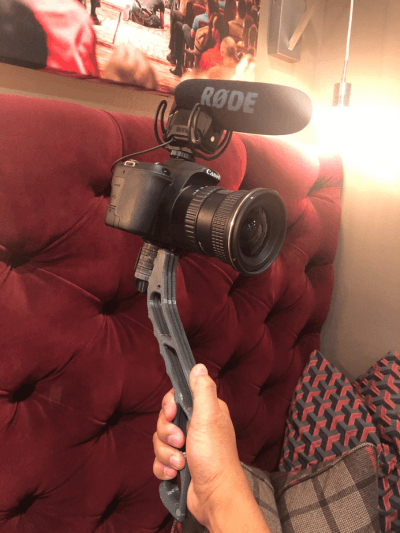 As more and more people entered the video space, and as cameras became more accessible and better and easier to use, vlogging had become a full-time career for many, and a fun hobby for millions more. 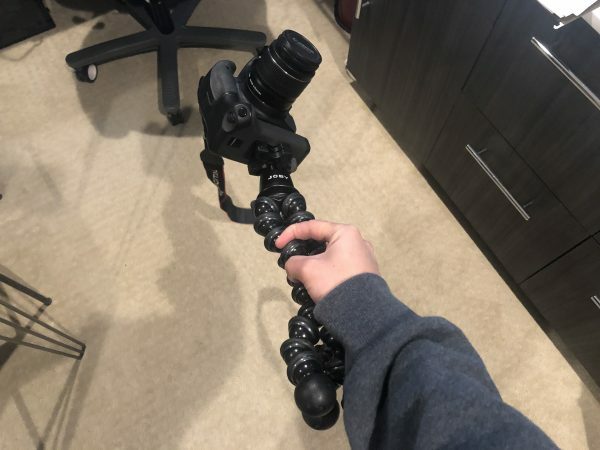 During all this time, however, the tripods built to hold cameras didn’t seem to evolve much, and once a few influential vloggers were seen holding the GorillaPod to film themselves (bringing the legs together and bending the legs to get the correct angle for a wider shot), it just became the normal solution for everyone filming consistently and on the go. 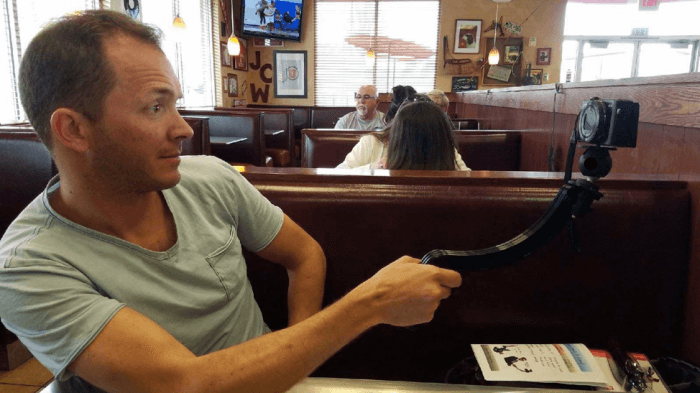 Vloggers took a product that already existed, and shaped it to fit their own needs. This is a classic example for where there may be a great business opportunity: when a product built for one use is being used in a different way. Instagram started out as a whisky sharing app (Burbn), but its photo editing filters are what caught most people’s attention. The bubble wrap we use in packaging today was originally designed to be a textured wallpaper. Frisbees were born from pie containers (shoutout to Back to the Future 3 for referencing this). The GorillaPod is pretty heavy, especially with a camera attached to it. I’m not the strongest person in the world, so when holding it out in front of me, I know it’s not going to be an incredibly long take. Second, when the legs are together, my tiny hands can’t wrap all the way around the grip. Okay, my hands aren’t that small, but still—it’s not comfortable to hold. What if it did this? What if it did that? It was a fun thought-experiment, something I tend to do daily with various things I see. I think most entrepreneurs have that sort of problem-solving mindset. But most entrepreneurs, like most of the times I’ve done this in the past, just let the moment pass. It’s fun to think about, but really—how would this even really happen? And then, right there in that moment, Richie Norton walked right by us. Richie is co-founder of Prouduct, a company that helps entrepreneurs take ideas for physical products and actually bring them to life. He was actually a guest on my podcast a few months before VidSummit, ironically, to talk about how entrepreneurs could create their own physical products. During the rest of the conference, Caleb and I couldn’t stop thinking about our idea. The problem was that our idea didn’t have any form yet—it was just a bunch of unorganized “what if” ideas. Researching and empathizing. They go hand-in-hand. First, we are both in our target market. This is good because we understand the environment, language, habits, and goals of our target market already, but sometimes (and I know this from personal experience) being in your own target market can work against you. It can lead to product decisions based on assumptions that could turn out to be completely untrue. What really matters is how other people in the target market think, and the more research you do, the less guessing there is. Luckily, we had a second thing working in our favor: We happened to be at a conference with hundreds of other videographers, YouTubers, and vloggers. Real conversations: the best way to conduct research. And the cool part was that most people we asked were happy to share. In the hour or two we spent talking to people, we learned so much. For example, we realized that many video creators—at least the ones who were there—travel a lot, and their existing tripod solutions were not very friendly to pack. They wished it was lighter with a smaller profile, but still sturdy enough to support their camera. Beyond the research, having empathy for your target market is also key. 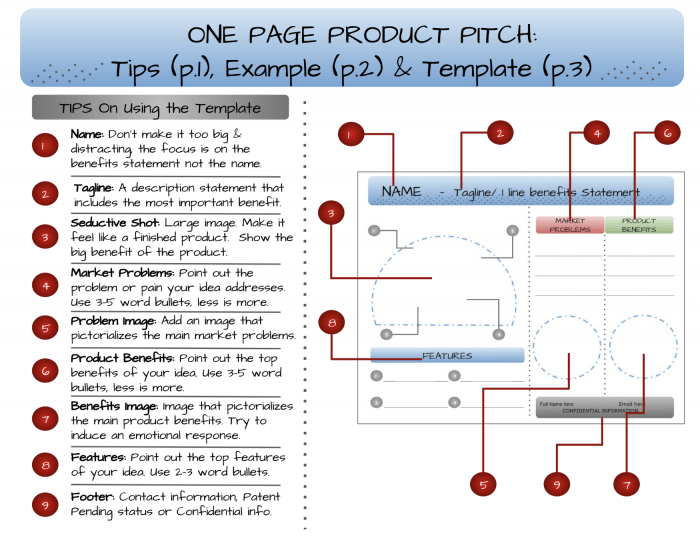 A simple strategy to empathize with your target market is to (drum roll please) . . . ask why! Video creators just want to create. They want to tell stories and share. Filming is their life, and anything that can reduce the friction of doing that makes them happy. So that became our goal—let’s create something that ultimately helps creators create more. Now that we had done a little bit of research and reconnaissance, we had a much clearer picture of what we and our target audience wanted. We also better understood the pains that people were having with their existing tripods, confirming a lot of what we already knew, but also learning a lot more, too. 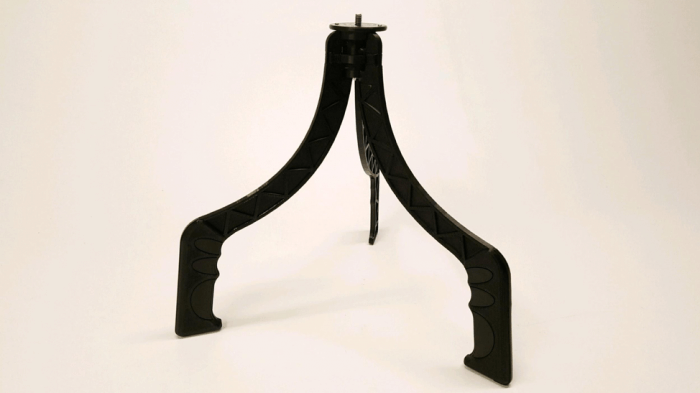 For example, many flexible tripod solutions get weaker over time and begin to “sag,” unable to hold the weight they once used to. 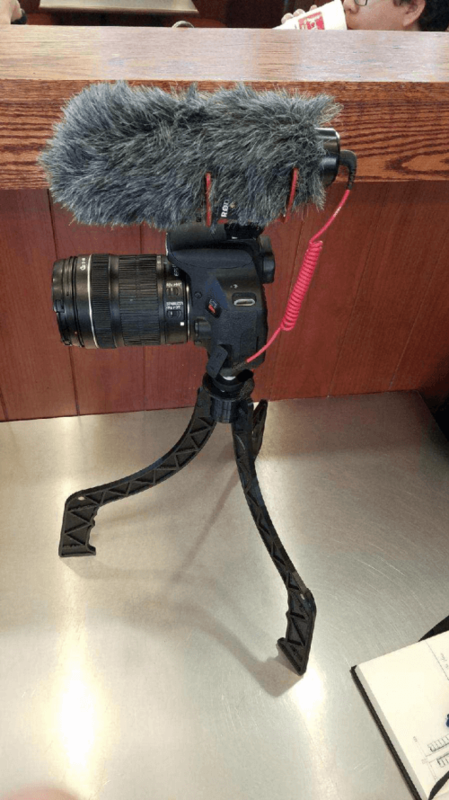 Another interesting finding was that 95 percent of the video creators we spoke to never used the flexible legs on their tripod to wrap around poles or trees when filming. And finally (and this is a big one), several people confirmed having their cameras fall over when on the tripod. A lightweight but strong solution to support filming both while moving around and while stationary. It should be easy to manipulate, low-profile, and easy to pack away for travel. 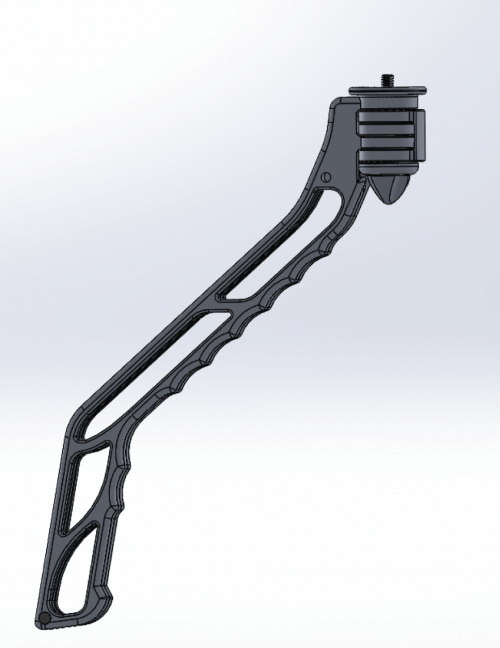 And this brings us to our first major design idea: A tripod with legs that somehow come together to create a single handle that one could easily grip to film with or carry. The legs would not be flexible, but the shape would mimic the shape that video creators use while filming on the go. How would it really work though? We’re not engineers and couldn’t even wrap our heads around the mechanism that would allow for this to happen. This is where Richie and his company Prouduct really came into the picture. After a quick call with Richie and Cole Chamberlain, an engineer on the Prouduct team, we realized that we didn’t have to know how the mechanism was going to work. That was Cole’s job to figure out. Cole just needed to know exactly what we wanted. The CobraPod was a temporary name just to give this project some life. The name SwitchPod came much later in a conversation Caleb and I had specifically about the name. In addition, Cole included some preliminary CAD (computer-aided design) drawings that showed how the mechanism would presumably work. 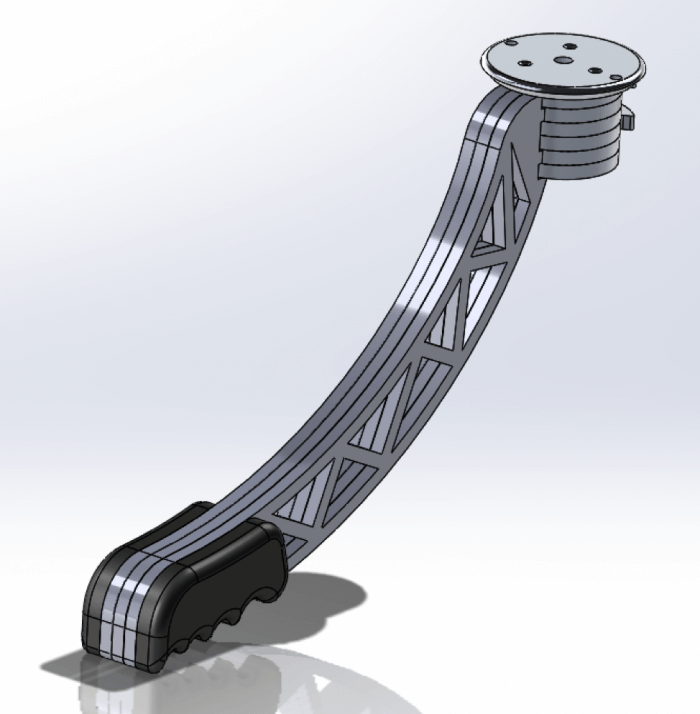 CAD drawings are important because with those plans in the computer, you can easily 3D print them and actually have something that’s real in your hands. Already from just having the images alone, we liked what we saw. Even though it was just designed on a computer, it was becoming more and more real. Another benefit of this stage is that we could already see what changes needed to be made. We were making decisions, and that was cool. The most common decision people need to make when they have an idea is just to get started, and it was awesome to know we were already past that point. The first obvious thing to us was the shape. Although the architect in me thought it looked cool, looking at the product in the “open” position, we knew it needed to have a different shape. It wasn’t going to be high enough. Make it too high, however, and the whole thing could topple over. These were cut shapes of plastic, although we could have just cut cardboard out just the same. Cole even included a couple random ideas with a few of the iterations, including one that had a strap and another with an extended piece of the arm to potentially make a camera easier to hold by resting the extension under your wrist. Nice ideas, but they weren’t going to work, and that’s okay. At this stage, it’s totally cool to have some fun and try new things. There’s really nothing to lose. 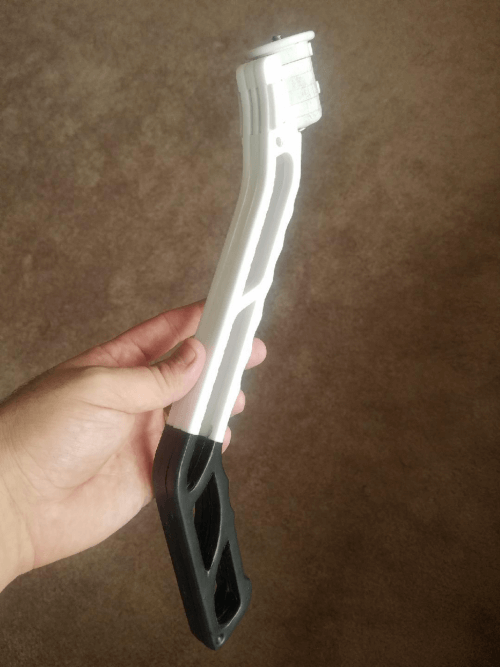 After some more conversations with Cole and another two weeks or so, we saw pictures of our first real working 3D Printed prototype from the team. To say I was excited was an understatement! I was stoked! When you look up close, you can even see the layers of plastic made during the printing process. It was incredible! I just wanted to get my hands on it ASAP, but the Prouduct team was playing around with it for a while. Some members on the team, including Richie and Jase Bennett, are video creators themselves, so we were interested to hear what they thought. This informed a later design that made finger grooves run all the way up the entire tripod, so it could become more versatile. We got it in the mail a few days later and played around with it. It worked, but the first thing we noticed was that the curve away from the handle was a bit weird. What if it was straight instead? And what if we could save some weight by adding holes in some areas? And what if we had a way to somehow lock the legs of the tripod open after it was deployed? Ahh, more “what ifs,” but these were ones that we could integrate into the design of our first iteration. 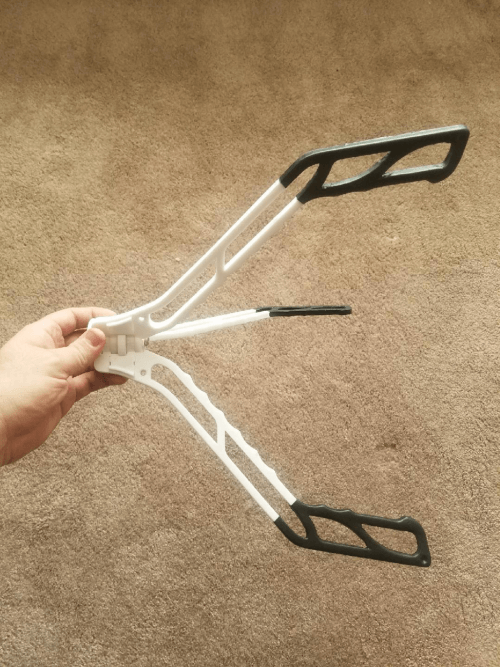 A few weeks later, another member of the Prouduct team, Thiefaine (who we call TFN) sent us some pictures of the newest 3D-Printed design iteration. This time it had a straight neck with finger grooves going all the way up, areas were cut out to save for weight and material, a robust latch mechanism that triggered once the legs were open was added, and it was also white! Cole also experimented with hand-dipping the handles in rubber to see how we liked that. Again, we were drooling to get our hands on it. Cole sent it over in a day. It felt great. The finger grooves were perfect. No matter the weight of the camera we used, we always found a place to grip that felt comfortable. The angle of the neck was good and we even filmed some videos with it just to test it out for a while. Unfortunately, once we started playing with the latch mechanism—opening and closing the tripod to see how it worked—little pieces began to pop out. Some tiny little springs did, too. Also, it required two hands to make it work. Could it potentially be done with one-hand? It was only a plastic 3D-printed prototype, but even so, I was getting a bit worried about how many small tiny pieces there were. This is where Caleb and I began to ask about manufacturing. How does that work and how much can certain decisions cost? 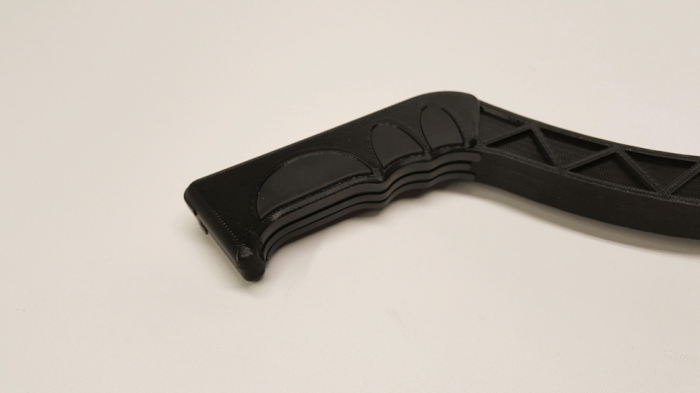 Manufacturing answers depend on what you’re manufacturing, but we quickly learned that the fewer the pieces, the better. 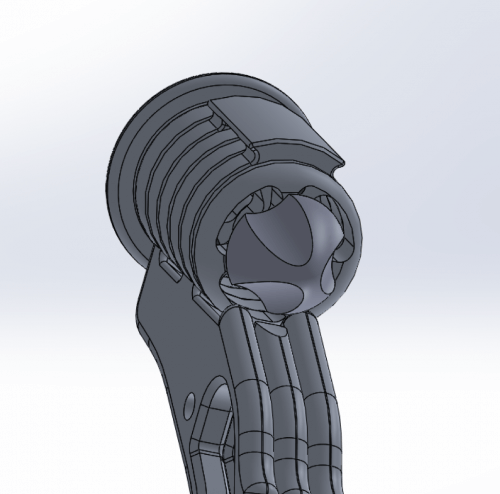 First, after our design is finalized, we’d be ready to create the molds for each part. Molds are just that—empty cavities in the shape of that part that, when injected with a certain kind of material (metal, alloy, plastic, etc. ), create that part. This is done on a line and your product can be created faster, and cheaper. A mold is needed for each part, and then someone needs to put the parts together to create the thing. Having no electronics in our device helps. We did not set out to create a gimbal or steady-cam, which is a popular option among videographers today. We wanted to create the best tripod for people to use their own cameras. Molds are, as we soon learned, very expensive! Depending on the design, we were told each mold for a unique leg could cost tens of thousands of dollars. It’s after the mold is created that the magic happens. Depending on durability, a single mold can create hundreds of thousands of parts for your product. In this video, however, he explains that he was just trying to solve the open and close mechanism. He didn’t need to print out and waste plastic on an entire leg to do this, he just needed something to test with. He inserted magnets in strategic places within the tripod and, like magic, it seemed to work—at least on video. If you move one of the legs out, after a certain point, it just seems to snap right into place. If we liked how it looked, he’d print another full size one for us to use and check out. He also showed us in the video that he liked the look of the rounded corners, rather than the flat corners. It was better to hold, so we told him to go with it. We were close, very close. Caleb took the larger model home for a couple of weeks and filmed with it just to see how it was used in everyday life, and in that process one thing became very clear—we needed an easier mechanism to get a camera on and off the tripod. At this point, there was just a screw with a hex head to tighten the camera. We thought it was time to print yet another version, but with the only big change being the knob, it was time to step up our prototypes. Instead of our plastic 3D-Printed models, it was time to explore materials. We decided to get one made out of aluminum to see what the metal would feel like, and then another out of a plastic. Since it was plastic, we could create it in any color we wanted, too, so we decided to go for a bright red so when we brought it somewhere to show people, it could stand out. Before sharing it, however, it was important to begin to think about protecting our idea. We needed to get a patent. I’m not an attorney or professional in this manner, but I do know it’s important to protect your ideas and inventions. With that said, even if we do everything right, there’s still a possibility for something we create to be ripped off. My online courses have been ripped off, and a physical product could easily be ripped off, too. With the right protection in place, however, it becomes a little harder to do. In the US, there are two types of patents: Utility Patents, and Design Patents. There’s actually a third called a Plant Patent, but it’s rare and we are not hoping to reproduce and create new kinds of innovative plants any time soon. The big dispute over iPhone patent infringements between Apple and Samsung were primarily about the design patents Apple owned, and the way the iPhone looked versus Samsung’s products. Based on a number of conversations, it was recommended that we get a utility patent. We did a ton of research before starting this process to see who we were up against. We also had a lot of help and advice along the way and sifted through several patents (which are publicly available on the USTPO site) to see if our mechanisms were to be found. I won’t get into the details of this process, but there are people you can hire (patent attorneys, and even LegalZoom) to help you make sure you’re not infringing on someone else’s intellectual property (IP). Still, there’s risk in sharing this before getting a patent, but how could we do more research and market this thing if it was going to take twelve months to get it filed? This is where the Provisional Application comes into play. Not a “provisional patent,” as it’s sometimes mistakenly referred to, because that does not actually exist. Just the provision application for a patent. In other words, applying for a provision allows us to essentially raise our hand and say, “Yes, we’re going to file a regular patent! But, yeah, we claim this IP.” Afterwards, a business can begin using “patent pending” in their product’s marketing. This dissuades others from attempting to create something similar, knowing we’ve already got a date to file our non-provisional patent. By the way, for more information about the patent process in the US, best to go directly to the USTPO website here for a process overview. A couple more weeks went by, and boom—we had our two new prototypes! One was aluminum in space gray that included some experimental rubber feet, and the other was a red plastic one that was even lighter, although it was a little warped from the hand-made manufacturing process. They each had the new knobs that made it easier to screw a camera on. June, 2018. VidSummit, Anaheim. It’s time to show them off, and see what happens. And this is where marketing starts. Sharing it not just with people in person (actually, that was more for reaction and feedback, and less for marketing), but sharing it publicly online, even though we weren’t even close to being finished. I wanted to bring people—and especially you, my audience—along with me on this journey. First thing we noticed, however, is that it was definitely getting people to stare. We heard people say, “What is that?” and had a number of people come up to us just to ask what this tripod thing was. It probably helped that as I was walking up and down the conference I kept opening and closing the tripod the entire time, which you can’t not look at when it’s happening. First, we made sure not to tell people how to use it. We wanted to see if they could intuitively figure it out. 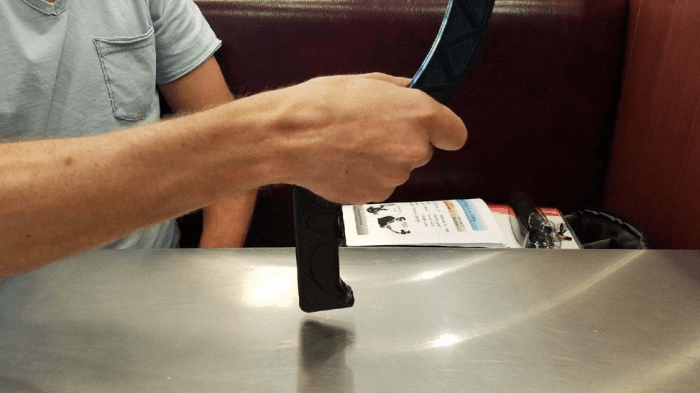 Since it’s simple to use, of course, and it was always like a cool surprising moment when we handed it to people closed, and they figured out how to easily open it. Interestingly, the price ranges between dozens of different people were not far off, from each other, and where we were thinking of pricing—somewhere between $70-$100, which is comparable to (and depending on the model, cheaper than) the GorillaPod. It felt good, real good. We also got some great feedback. Jase Bennett on the Prouduct team had the red one in hand with a point and shoot camera on it all day. He was going to share it with some of his YouTuber friends to see what they thought, and when he reported back to us—it was the exact same feedback. Super positive, and everyone wanted to know where they could get one. It was a good start, and we were excited for who else we were going to meet on day two of VidCon. The next day, it was much of the same. SwitchPods and cameras on hand, and many more conversations with people. Overall, it was an excellent trip, although personally I was a little overwhelmed with the main areas of VidCon, which were mostly geared toward kids trying to get a glimpse of their favorite YouTube celebrity. Most of the work we did was upstairs in the creators and industry level area, and that’s where we collected most of our feedback. As far as materials, the metal one felt much better. It was smoother and it had some nice weight to it when it flips open. The plastic one was lighter and although it still worked well, when a DSLR camera was put on it, it began to feel a bit top heavy and even a little flimsy. The metal prototype we had in hand was aluminum and cost $2,000 to make. Yes, $2,000 for a tripod! But that’s because it was a prototype, made out of aluminum, by hand. There are no molds yet (hence, the Kickstarter campaign), and someone has to take a chunk of aluminum, and essentially turn that into the shapes we wanted. Unit costs will vary after the molds are made depending on the quantity ordered (the more you order, the less the unit cost will be), but this is how it’s done. Another factor in pricing is ultimately where the product gets produced. Richie and the Prouduct team recommended China. They visit quite often to continue the good relations they have with the manufacturers there, and they found an incredibly clean, secure, and trustworthy manufacturer who agreed to be the one behind this product, should we choose to move forward with it. They helped to tool all of the aluminum prototypes we have so far. As much as I trusted Richie and the Prouduct team, there was a part of me that hoped we could get this thing made in America. We soon found out why everything seems to be made in China, however. This would be a very tough job to accomplish, and we’d have to increase our Kickstarter goals to even have a chance of being able to finance production in the states. We knew we were creating a great product for people all over the world, so I personally believe that although we are not manufacturing the product in America, we are bringing something new to the market that can help creators from anywhere create better videos and run their business. With our SwitchPod prototypes in hand, we felt like we were close to the final prototype, but not quite yet. We had a debate about the grips on the bottom of the feet and wanted to increase the knob size to help make it easier to attach a camera, but in general, we were happy with what we had. Marketing efforts are where my head was at. Luckily, we had an opportunity coming up soon for something potentially big. Casey put vlogging on the map, especially in 2015 when he started to vlog daily on YouTube. He’s one of my heroes. And for the SwitchPod, having a person like Casey tell his audience he uses the SwitchPod would be a massive dream come true for the product and for me. Chances were SUPER SLIM I’d even get a chance to meet him, but we were both keynoting this event so . . . possible? But again, who knows if I’d even see him, and even if I did saw him, how could I meet with him and talk to him about the SwitchPod? Heck, even if I literally chased him down the street, he’d outrun me like it was nothing—the man runs ten-plus miles a day. Caleb and I knew that it could just take a single key influencer to really put the SwitchPod on the map, but we’re also people who are really sensitive to influencer marketing and just how dirty those words can be sometimes. There are influencers who promote products just for money, disingenuously promoting things just because it puts more dollars in their pocket. And companies and product owners are either throwing tons of money at people with large followings, or begging (or worse, bothering) influencers with ask after ask after ask. We didn’t want to do it that way. Some people can, and they do it well, but that kind of aggressiveness is not in our DNA. We wanted any promotion to come from a genuine relationship with someone, or a genuine curiosity for the product (or both!). We didn’t want anything to feel forced. Caleb, being in the video creator space already (check out his YouTube channel), has a ton of friends and colleagues who had already expressed interest in supporting the project. I’m also connected to a lot of video creators and friends who, after a quick ask, have decided to support the product. Why? Because that’s what friends do. There’s value exchanged in both directions when you have a real relationship with someone, and getting to the point of asking for favors takes time. It takes you giving value and being trustworthy, and it also takes you asking for help when you need it. It’s okay to ask your friends and network directly for help, and honestly it’s recommended. 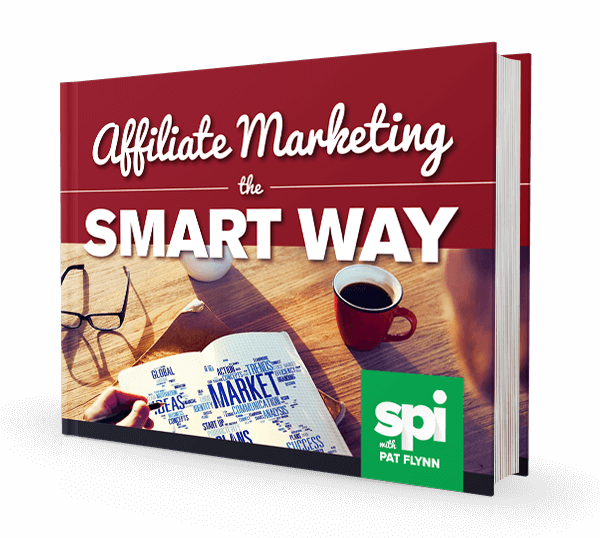 You may be surprised, your network could be an extremely key part of your success, and you shouldn’t rely on just finding one slim chance influencer when you have guaranteed support in your life. Start with that. We did. But sometimes—sometimes you get an opportunity that you don’t think will happen. With Casey, it would be huge, but we went into the event not expecting anything. If we can’t do this in a genuine way, we don’t want to do it at all. We’re not foolish though—of course we were going to bring the SwitchPods with us and carry them with us at all times! Casey wasn’t even at the event on the first day. The keynote went well, however, and the SwitchPod did get some love from passersby. 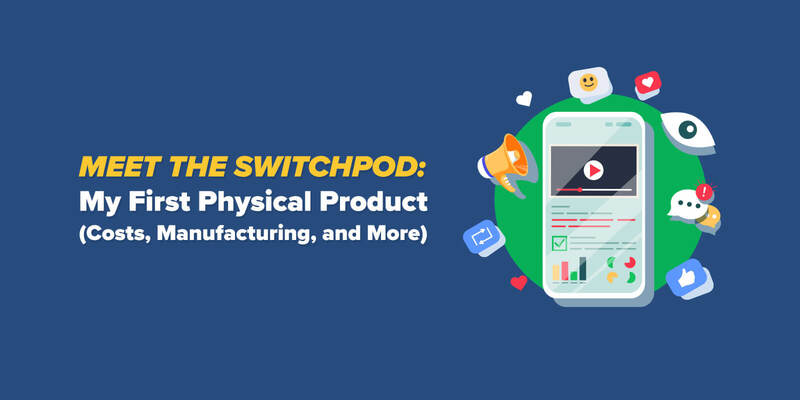 It was fun to talk to other entrepreneurs and share the story of the SwitchPod and how it came to be. Casey was there for his closing keynote, and he crushed it. Just, wow. I was even more inspired listening to his story about how he got his start, his HBO show, his business endeavors, and how he took money from Nike for a commercial he was commissioned to do and just blew it on traveling the world, which was actually THE COMMERCIAL he created and it become an epic success. He is a masterful storyteller and craftsman behind the camera, and honestly even if the SwitchPod wasn’t a part of the equation, I’d still love to meet him. After the event, some of the speakers and VIPs were up on the roof of the hotel for some hors d’oeuvres and drinks, and lo and behold, guess who decided to stick around and join us. Freaking Casey Neistat himself. Like, he was just there, hanging out, talking to people. Caleb and I probably looked like a couple of high school kids giggling in the corner while stealing glances at the hot guy on campus. Casey was surrounded by a group of people, so I didn’t want to interrupt. While at the bar waiting for a drink, I see him start to make his way toward us. This is not a drill folks! Wait, who else is talking about this here? Nevermind. 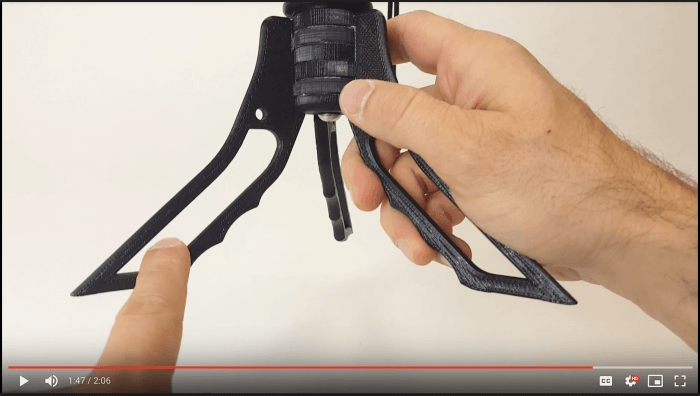 Casey Neistat actually asked to see our invention! I handed it over. I introduced myself and Caleb, and all throughout our explanation of what this thing was, he was playing around with the hardware—opening it, closing it, playing with the screw knob, holding it out in front of him, putting it back down to his side, holding it out in front of him again. Like he was a machine doing a calibration or something. It all happened so fast, but it really happened! He said some great things about the SwitchPod, too. He really liked that finally someone focused on creating a tripod solution specifically for vloggers. He even went into a little history about the GorillaPod and how vloggers have just made it their own, but vlogging is not what it was built for. That was huge. We were thinking of creating all kinds of colors—space gray, YouTube red, and others. But just black. It seemed so simple, yet when Casey said it, it makes complete sense. We didn’t want to take much of his time, but he said we were doing good work, and that was a big win. Just to be clear, Casey did not endorse the SwitchPod or say he would support the final product. He saw it, he gave positive comments and offered suggestions, and that was that. And honestly, I couldn’t have asked for anything more. We also captured video footage of Casey during this time while he offered his feedback and handled the SwitchPod, but again—to be respectful to him and sensitive to how that may be misinterpreted, Caleb and I decided not to share it. It was just useful for us to hear back what he said because I really wasn’t able to remember much of the details. I was still a bit starstruck. With Casey’s suggestion to make the SwitchPod shorter on our mind, we wanted to see what the new size would feel like. Cole 3D-printed a new version based on a reduction of about 15 percent and sent it right over. After taking it out of the box and holding it up, I knew—this was the right size. It just felt . . . better. Plus, beyond that, this is a massive savings in materials over the long haul! Thinking back, we probably should have tried various sizes much earlier in the prototyping phase, all the way back to when we were just testing shapes and sizes. We didn’t expect to go smaller, however, because we were basing our measurements off of how people used the GorillaPod. It makes sense, though, because smaller was not possible with the GorillaPod. Yes, there are different sizes, but everyone had the biggest one because they all had heavier DSLR cameras. We had a new, wider knob on this one, but the knob still wasn’t feeling quite right. We were going to shoot for longer in our next prototype. 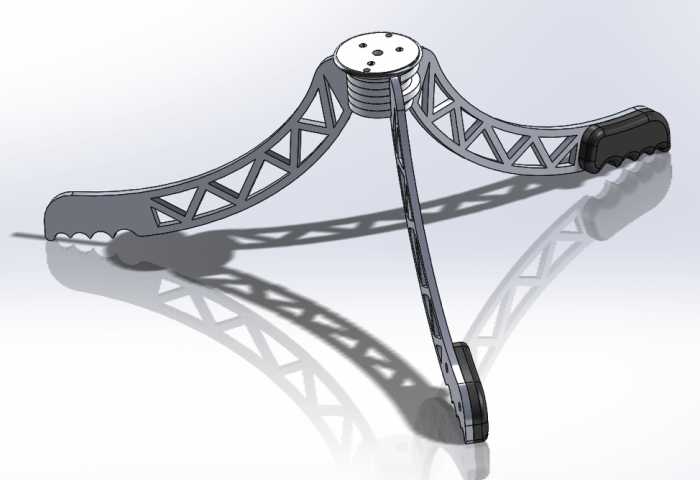 The main part of the tripod, however, was finalized. We were super close to a final prototype! 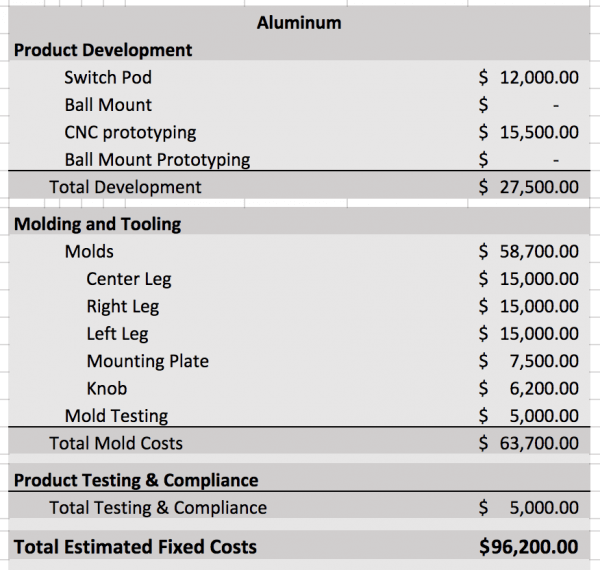 After that happens, you can work with your manufacturer to get real potential costs for the molds, and also the unit costs. That was our next goal—to get to that point. During this time, we also began an Instagram account and a Twitter account, because we wanted some social behind this brand, too. Small marketing efforts were now a part of the process, although we knew once the prototype was finalized, it would be full on with marketing efforts to mobilize our network, prepare the Kickstarter campaign, and shoot some amazing video footage and photography to support the product across all channels. Yes, the same event where this very idea was born! If we had our final protoypes in hand by then, we could rock our new SwitchPods in their almost-final form, and really get people talking—hopefully not just with us, but with their audiences, too. Because remember, this was an event full of video creators. The prototypes did come in on time, and boy—were they smooooooooth . . .
Plus, the proportions just look better at this height, don’t you think? Caleb and I spent a majority of the event in the hallways sharing the SwitchPod with people. Because of the way it works and who we were showing it to, we didn’t have to do much to draw attention. We were often stopped while on our way somewhere, just because someone wanted to ask about it. 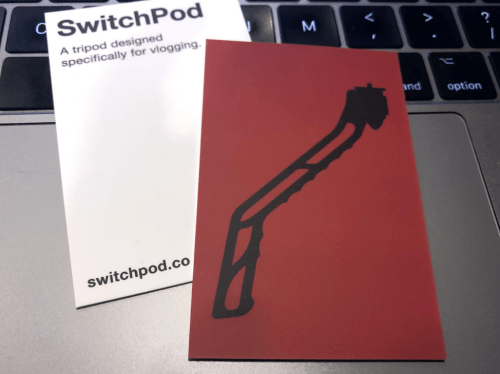 And of course, we had our business cards to hand out, although the silhouette of the shape of the switchpod was from our older prototype, but only we know that. Having an easy to follow domain name (switchpod.co) was helpful, too. 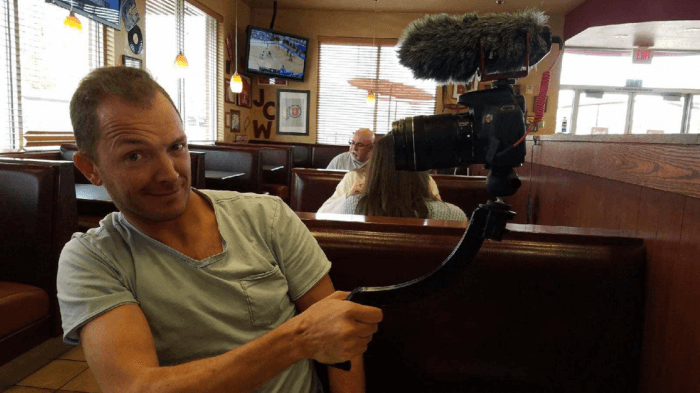 Some of our friends, including Sean Cannell from Think Media and Justin Brown from Primal Video spent time to shoot some footage with the SwitchPod to help when the product releases on Kickstarter, which was super generous of them! And Derral Eves, the founder of VidSummit, even took notice. He gave us a huge pat on the back and was stoked that this idea was born the prior year at his event. He even took the time to introduce us and the SwitchPod to some key influencers in the world of video at a private event we were invited to, which was literally GoKarts, and was amazing. It’s just been really amazing to see people get behind the product. For me, although I’m not known for my video work per se, it’s been really fun to share this journey with my audience along the way—for over a year now. Even the moral support from those who wouldn’t buy a product like this is just incredible. Thank you! We ordered a couple more prototypes (at yes, $2,000 each), but we were all in at this point. Green light: Yes, we were going to kickstart this thing! Up to this point, we were about $30,000 into the process. This includes all the prototypes we ordered, and the help we received from our friends at Prouduct. It includes the provisional application for a patent, the branding work, and web-related things. Many may say this is a gamble. $30,000 on the line before even REALLY validating this thing with dollars behind it is not something I just brush away—this is a serious investment here—however, as you can see, we have had many clear stop or go points along the way—points where we could ask ourselves, do we want to keep going, or are we done here? So far, the lights have all been green and we’re stoked to see it enter this next phase when it’s out there and people can vote with their dollars. I really do hope this gets funded so that we can have the molds made and place our first order. That would make me so happy! But you know what, even if the Kickstarter doesn’t go well, like I said earlier, it would have been an expensive learning lesson, and I’m okay with that. Well, hopefully you’ve been inspired by this journey of ours thus far. It would be really cool if you checked out the Kickstarter Campaign Page to see how things were going, and you know—if you wanted to help increase the chances of hitting our goals, we wouldn’t be opposed to it, of course. And a huge thank you in advance to anyone who does support the campaign, even if that just means you share it. Really, thank you. Even if we do get funded, Kickstarter is not the end. In fact, it’s really just the beginning. When we have real customers, there will be real-world stakes. We must be open with communication with our customers during the manufacturing process so that everyone stays in the loop along the way. It’s going to take a while to get these things made, and then shipped. Once we have funding for the molds, the molds itself could take about six weeks. The product order will take about four weeks to fulfill, but we should also get samples to test a few of the products off the line before completing the rest of the order. Then the product gets put on a boat for another four to six weeks on it’s way to the US. The products then get shipped to a fulfillment house where they are then packaged (if not already packaged in China, which is a possibility) and then shipped to backers. We are advertising an August delivery date, however we can definitely get it in ahead of that if everything works perfectly, which it is likely not the case (hence the buffer period). This was a tough one. We didn’t want to create a massive funding goal in the hundreds of thousands, because that’s quite high for a Kickstarter campaign. There’s something to be said for marketing and PR purposes to reaching a funding goal sooner than later, if possible. With that said, make it too low, especially when you have to pay for molds and manufacturing, and you won’t have enough to place your order, or you’ll have to order fewer units at a higher cost per unit. Our declared Kickstarter campaign goal is $100,000, but we would love to double that. Overall, this will not be a home-run profitable venture until we successfully fund the campaign and then have enough to order another round of product. That second sale, for example, whether that comes from Amazon, our own store, retail or other, since the molds and pre-manufacturing are all taken care of already, the margins would be significantly higher. Now, there’s one thing you might be seeing on this chart that you might be wondering about. There are zero dollars spent on it, but there is significance there, and that’s the ball head. Trying to create and manufacture two products, versus just one and really get it right didn’t make any sense. 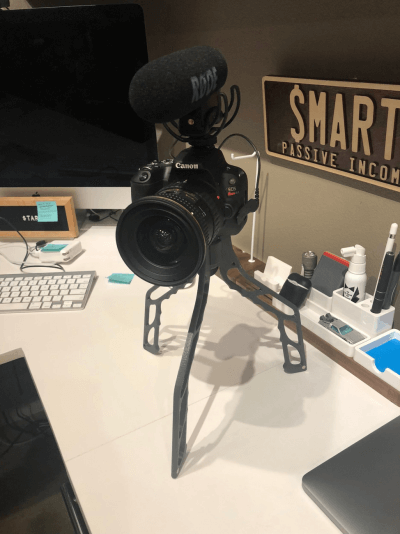 Since this is our first attempt at this, we decided to drop the idea of the ball head, for now, and focus solely on making the most amazing tripod for vloggers. With the screw on the SwitchPod, you can actually attach any ball head or quick release anyway. When we met Casey, another question we asked him was if he would need a ball head on it, and he said no. He wouldn’t use it with one. I think it was smart not to develop another product on top of this one, which would also confuse the Kickstarter campaign. We wanted to keep it simple. As you’ll see on the Kickstarter page, there aren’t a ton of different combinations of products and offerings. It’s simple, grab one or more (maybe as a gift, for for separate cameras you might have), and that’s it. No matter what happens, I’m happy with all we’ve put in thus far, and whatever the outcome, I’ll be stoked to have learned so much about this world of inventing and manufacturing a physical product. It’s been a pleasure to work with Caleb on this journey as well. I think it’s really important, when you work with a partner, to always be open and completely honest with each other. There were many moments during this journey where we’d check in to see if we were pulling our weight for each other, and it always seems to even out when we both believe in the product and campaign. Also, a big shout out to our wives, Caleb’s wife, Jen, and my wife, April. They’ve both been super supportive during this process as Caleb and I focused on this new business on the side of everything else we do. And Jen, she’s got some talent behind that camera—a lot of the pictures on the campaign page were her doing. Thanks, Jen! And finally, the big question I’ve been asked quite a bit: Where do we want this to go? What’s the endgame? If it becomes a little machine that runs and turns a quiet profit each month, I’d be fine with that. Hopefully we’d put systems in place to automate the process as much as possible, and we could continue to use this product to experiment with other fun things, like how one might get this in a retail store, or maybe on Shark Tank. As long as we’re having fun, that’s all that matters. I’d also be happy, obviously, if this blew up. It’s been hard to not start drawing ten other physical product ideas now that I understand how this works, and so I’ll keep those ideas in my shoebox for later, just in case. A full company that churns out amazing physical products on an annual basis (or more) could be very fun, especially when a lot of the products are things that scratch our own itch. And yes, we have discussed selling the product or idea to another more reputable company in the tripod or video space, should that ever be an opportunity that comes our way. We’d be open for seeing an offer and exactly how that might be structured, but selling the product or company would be a win in our eyes, too. I hope you enjoyed this journey with me, and I hope you continue to be on it with me. Check out the Kickstarter Campaign for the Switchpod if you haven’t already, and please, if you liked what you read here, a quick share would be amazingly helpful. Thank you, and all the best to you and your fun outside-of-your-comfort-zone projects! This blog post was written a couple weeks before our launch, and as you may have already seen, the campaign for the SwitchPod has gone much better than expected. We reached our funding goal of $100,000 in just 11 hours and 26 minutes, and after Day 2, we more than doubled that. The initial wave has slowed down, but we expect there will be several more waves of exposure between now and March 30th, both organic and through upcoming paid advertising campaigns. Although the campaign is now live, I’m continually documenting our steps and decisions along the way for you, and I plan on publishing a recap after the launch has ended. I hope you enjoyed hearing how this all came together. When the campaign ends, that’s actually when the real hard work begins. We must deliver this with quality and on time, and that just doesn’t happen automatically. In the meantime, thank you so much for your support. Both Caleb and I appreciate it so much! If you haven’t had a chance to check out the campaign yet, click here to see where it’s at now. And finally—probably the best moment to happen so far since the launch—make sure to watch this video that mega YouTuber Peter McKinnon created after we sent him a handmade prototype. Pay careful attention to what he says about how Caleb and I approached him.